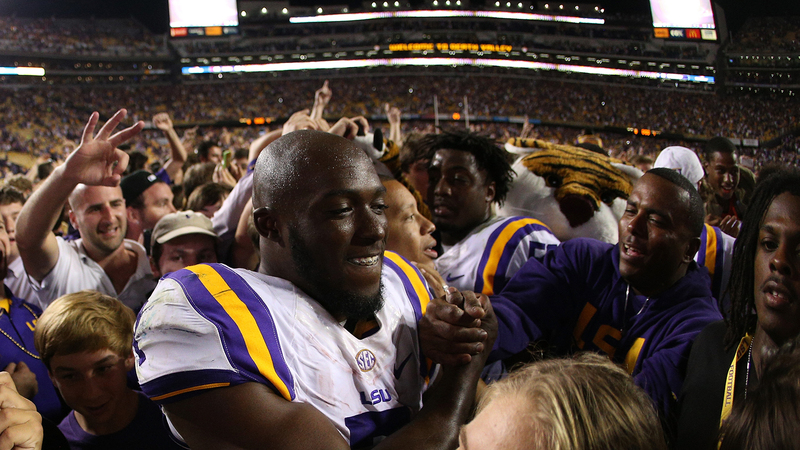 » The Legend of Leonard: Can LSU Capitalize on Fournette’s Sophomore Surge? If LSU’s star running back wants to strike the Heisman pose for real, he’s going to need a little help from his tiger-striped friends. The first thing to remember about the play that cemented Leonard Fournette’s reputation as a legend-in-the-making — you know, that play, the Thanksgiving-night, Herschel Walker–channeling run at Texas A&M that set off a minor tremor throughout college football — is that his victim wasn’t some random, unwitting scrub who happened to find himself in the wrong place at the wrong time. Like Bill Bates before him, A&M’s Howard Matthews was an established veteran — a senior who would finish his college career with 30 consecutive starts and 258 total tackles to his credit, and was known to inflict a little pain of his own. Before he wound up flat on his back that night, Matthews was exactly where he was supposed to be. And because what happened stands as Exhibit A of Fournette’s impending conquest of the SEC, it appears Matthews is going to be there in perpetuity. Well, maybe; with time, and with many more additions to Fournette’s hit list presumably still to come, Matthews will be able to look back at his part in Fournette’s origin story with a sense of humor. (Sumlin declined to describe the reaction to the play among Matthews’s teammates in the film room.) Here’s hoping he does; like his coach said, there seems very little question that the moment is going to be around, if not forever, then for a very long time. If nothing else, it’s destined to endure as a testament to the sheer power of Fournette. There he was, this 6-foot-1, 230-pound ballast tractor of a running back. The object of so much scrutiny from college coaches since before he started shaving, he had arrived at LSU hailed as the heir apparent to other freakish, fully formed freshman talents like Walker, Adrian Peterson, and Maurice Clarett. At 19 years old, Fournette boasted the kind of raw talent that inspired Les Miles to invoke comparisons to Tiger Woods1 and Michael Jordan before Fournette had even suited up for his first college practice. After a quiet start to his debut campaign, he suddenly appeared at College Station, intent on making the hyperbole look like an understatement. Although the cumulative numbers didn’t necessarily back him up, by that point in the season we’d already seen enough of Fournette’s precocious feats of strength to believe that, yeah, this kind of thing could be the new normal. Whatever the box score might say, his physical prowess spoke for itself. We’d seen Fournette log 20-carry outings against three of the league’s heaviest defensive hitters — Florida, Ole Miss, and Alabama — in a four-week span, with virtually no support from the passing game. We’d also seen him run so hard against Ole Miss that the Rebels literally ripped the face mask off his helmet in an effort to wrestle him down. Before the Ole Miss game, Fournette had generated most of his production in glorified scrimmages against Sam Houston State, Louisiana-Monroe, and New Mexico State. But once he got going, he built up a head of steam that carried him through the end of the regular season, culminating in a career-high 146-yard outing against the Aggies and a 143-yard encore against Notre Dame in the Music City Bowl. It was there, a little more than a month after hitting the truck stick against Matthews, that Fournette finally unfurled the blazing, breakaway speed that he had only teased during through the first 12 games, first on a 100-yard kickoff return, then on an 89-yard sprint that left tread marks on the Fighting Irish front seven and an exhaust cloud for the secondary. That run put Fournette over 1,000 yards for the season and gave him LSU’s freshman rushing record. And these late-season performances ensured the buzz surrounding his sophomore campaign would be set at 11. 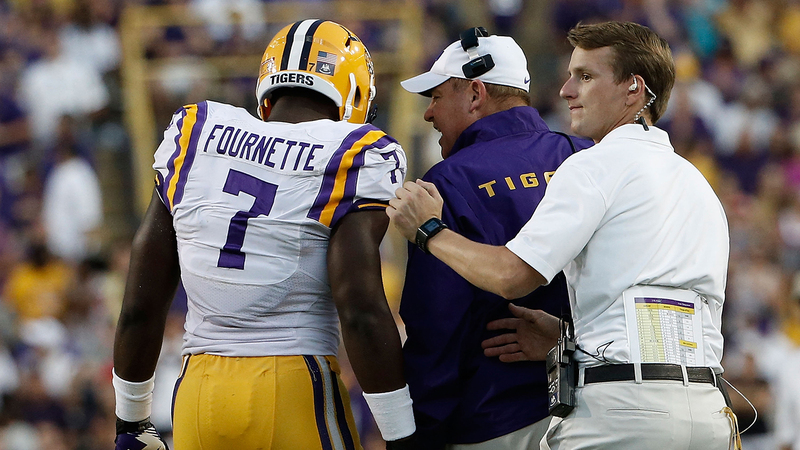 Publicly, Fournette has taken his coach’s message to heart. Before last season, he talked openly about his ambition to win the Heisman Trophy as a true freshman — something even Walker and Peterson failed to achieve in their prolific debut years — then playfully struck the stiff-arm pose after scoring his first career touchdown (a 4-yard run against Sam Houston State). Modern running backs have an uphill climb to the Heisman stage. Since 2000, 13 of the past 15 winners have been quarterbacks. Last year, Wisconsin’s Melvin Gordon was consigned to the silver-medal stand in New York despite rushing for 2,587 yards, more than twice Fournette’s total and more than 500 yards better than any other FBS rusher;2 where Heisman voters were concerned, the best individual season by a college running back since Barry Sanders was good for only 37 first-place votes compared to 788 for the winner, Marcus Mariota, who became the fifth consecutive quarterback to take the trophy. In the spread era, any candidate who isn’t a quarterback faces a dramatically higher bar than ever before, even in a season like this one, when there is no consensus QB front-runner. Gordon outpaced the SEC’s leading rusher, Auburn’s Cameron Artis-Payne, by more than 900 yards, or 61 yards per game. Offensive linemen Will Blackwell (2011) and Herman Johnson (2008) each appeared on at least one postseason All-America team as seniors but weren’t consensus picks. Given a workhorse like Fournette, or like Jeremy Hill before him, Miles is willing to ride him hard in big SEC games. Given a choice, though, he will almost always prefer to spread the carries around. Scott, Ridley, and Hill were first-team All-SEC picks in 2008, 2010, and 2013, respectively, but didn’t make a dent in the Heisman conversation or (more importantly) carry LSU to a division title. Miles’s best teams, in 2007 and 2011, boasted a deep, largely interchangeable rotation of backs who were collectively able to drag the offense into the BCS Championship Game opposite a killer defense.4 By comparison, of the running backs who have finished in the top 10 in Heisman voting in the same span, all but one has exceeded 1,600 yards on the ground (Michigan’s Mike Hart came in fifth in 2006 with 1,562 yards), and the only two who earned fewer than 20 carries per game against FBS opponents (Reggie Bush in 2005 and C.J. 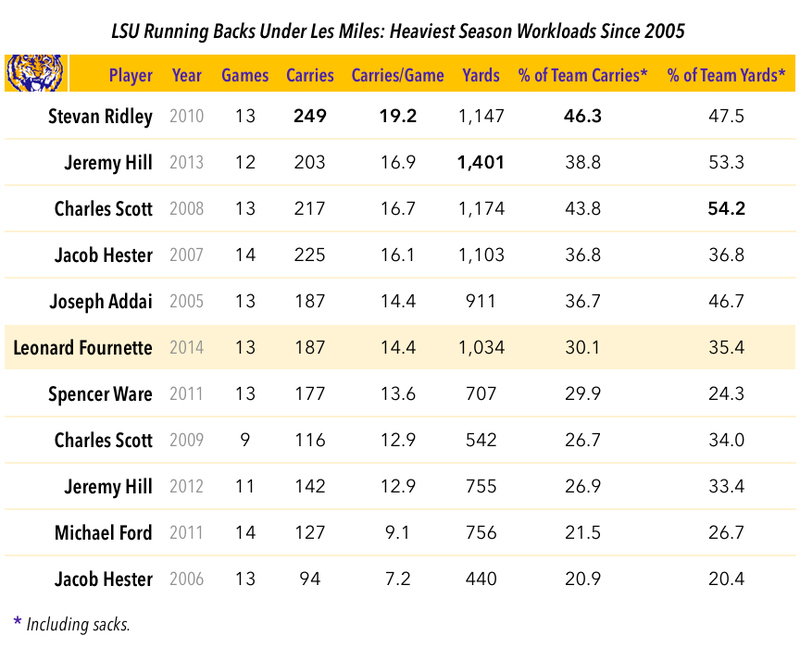 Spiller in 2009) made up the difference by being more heavily involved as receivers and return men than any LSU starter under Miles ever has been. Not coincidentally, the 2011 and 2007 outfits also boasted the two best defenses of Miles’s tenure, units that respectively ranked second and third nationally in Defensive S&P+. Barring any kind of freak injury, Fournette is more than capable of shouldering as many carries as his coaches are willing to give him; where they decide to set that limit, given a very green stable of backups vying for leftover touches, is a different question entirely. However the carries eventually get divvied up, it’s hard to imagine any of Fournette’s long-term goals coming to fruition — individual, team, statistical, or otherwise — until the Tigers resolve their ongoing instability at quarterback. The incumbent starter, Anthony Jennings, posted the worst pass efficiency rating among full-time SEC quarterbacks in 2014 and the worst completion rate (48.9 percent) of any regular passer in a Power 5 conference. Early on, Jennings inspired such little confidence that coaches benched him in favor of true freshman Brandon Harris, only to watch Harris crash and burn in his first (and so far only) career start, against Auburn. From that point on, the Tigers’ best performances down the stretch came in games in which Jennings passed for 110 yards at Florida (a wild, 30-27 victory driven by three Gators turnovers), 142 yards against Ole Miss (a 10-7 victory that was every bit as grueling to watch as the score suggests), 76 yards against Alabama (a 20-13 defeat in overtime), and 107 yards against Texas A&M (a 23-17 victory over one of the SEC’s most generous defenses). So far, most of the first-team reps in preseason camp have reportedly gone to Harris, although whether that’s a sign of the sophomore’s progress or merely the residue of Jennings’s offseason legal trouble is unknown. In the end, Fournette is right: His chances of adding to his personal trophy shelf will be largely inseparable from his team’s success, and a serious, late-season Heisman push probably isn’t possible without a serious, late-season playoff run. LSU will open the season ranked 13th in the Coaches Poll and 14th according to the AP, and was pegged by SEC media as a distant no. 3 in the West Division behind Auburn and Alabama. If those team predictions pan out, Fournette would need to put up the kind of numbers (somewhere in the neighborhood of 1,800 yards and 20 touchdowns, if recent precedent is any guide) that would rank among the best rushing seasons in SEC history for him to receive serious Heisman consideration. A Herculean effort like that would require racking up a lot of pointless mileage in blowouts, on top of eye-catching stat lines against top-shelf defenses like Ole Miss and Alabama. On the other hand, if Fournette remains healthy and the Tigers manage to get something resembling competence from the quarterback position and a vintage performance from the defense, then the escalating statistical benchmarks for his position will likely matter a lot less than being the centerpiece of a championship contender. Fournette already has name recognition; more importantly, because of the attention he generated late last year, he also has the kind of cachet as an athlete that can transcend numbers if he continues to make viral-worthy plays in high-profile games. He’s one of the few players whose appeal lies as much in the spectacle as in his stat line. If LSU also happens to win a series of key, low-scoring demolition derbies in the most respected, relentless division in the nation, Fournette is in position to reap the headlines with numbers that look more like, say, Jeremy Hill’s in 2013 than Melvin Gordon’s in 2014. Just as Gordon’s campaign was derailed last year by a dismal effort in his final pre-Heisman act (a 59-0 rout at the hands of Ohio State in the Big Ten championship game), an emphatic statement by Fournette on a similar stage could be decisive. If the early odds are any indication, the door is as open for a running back to make a move on the Heisman as it has been in years. And with the possible exception of Ohio State’s Ezekiel Elliott, no returning back has more juice than Fournette. This piece has been updated to remove a mistaken reference to Hugh Freeze discussing Fournette at SEC media day. That quote was from a separate conversation.